HomeCinemaMasalaMirzya’s title track is out! Mirzya’s title track is out and this is just what has us all await the film all the more! The beautifully crafted piece of content creates immense intrigue about the film as it hardly gives insights into the story line of this action-romance. Harshvardhan Kapoor and Saiyami Kher display exuberant chemistry in both the fantastical world as well as the contemporary world. As the lovers grapple with forces that seek to keep them apart in both avatars, they discover that a moment of true love together is worth sacrificing lifetimes apart. 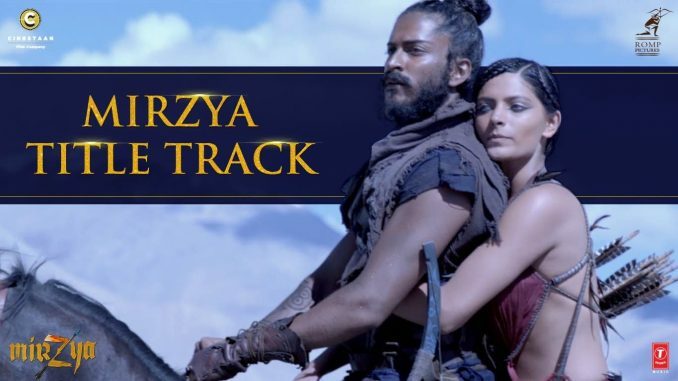 Mirzya’s title track beautifully showcases the essence of the film which is inspired from the folklore of Mirza-Saibaan, while exhibiting the intriguing love story shared by Harshvardhan and Saiyami. Rakyesh Omprakash Mehra has shot the song at exotic locations making the Mirzya title track an absolute visual delight. The song also proves to be an auditory treat with Daler Mehndi leading with vocals in addition Sain Zahoor, Akhtar Chinnal & Nooran Sisters, The Salvation Singers, Nikita Deshpande & Sapna Pathak. There is wondrous touch of Rajasthani folk music blended with contemporary notes. Daler’s Punjabi touch combined with the Rajasthani folklore picturesque makes for an interesting content. There is a touch of royalty and richness in the film which resonates thereafter! This high energy vocals sure leave lasting impact! Witnessing the popularity of the song post the trailer launch of Mirzya, the makers decided to launch the title track first. The film introduces Harshvardhan Kapoor and Saiyami Kher, along with Anuj Chaudhary, all of whom make a dramatic entry into the world of cinema in this untold love story of estranged soulmates. Along with them are the screen masters, Om Puri,Art Malik, K. K. Raina and supported by Anjali Patil. The timeless epic is brought to life by the director of Rang De Basanti, Delhi-6 & Bhaag Milka Bhaag, in his inimitable vision, in the words of famed poet and lyricist Gulzar. The trailer of the film had everybody intrigued and the music left us bowled over ! There has been immense anticipation around the films story line and we just cannot wait for the film to release . The movie is an epic action-romance, set in contemporary times. CINESTAAN Film Company and ROMP Pictures proudly present Rakeysh Omprakash Mehra’s – MIRZYA, a film inspired by the legendary ‘Mirza Sahiban’, a tragic tale of star-crossed lovers. Accompanied by heightened drama and action packed sequences, the film plays out in two parallel worlds – the legendry folklore and modern day in Rajasthan, India. Directed by Rakeysh Omprakash Mehra, Harshvardhan’s, Mirzya is scheduled for a grand release on October 7, 2016. When Sidharth Malhotra and Katrina Kaif partied in Kolkata’s Tram!